Places of worship, housing, entertainment as well as business purposes are among the many reasons why people build structures, however in Thailand, spirits are also taken into consideration. The Thais believe that spirits occupy the land and when a new development goes up a spirit house should also be erected to provide lodgings for them. The belief is that if the developer does not accommodate the spirits in this manner, he runs the risk of a haunting retaliation. The spirit house itself is small in size and can be likened to a pimped up birdhouse. Not only are the spirits supposedly appeased by this, they also protect you and bring you luck, especially if you give them favourable offerings. Acceptable offerings include fruit, rice and strawberry Fanta. 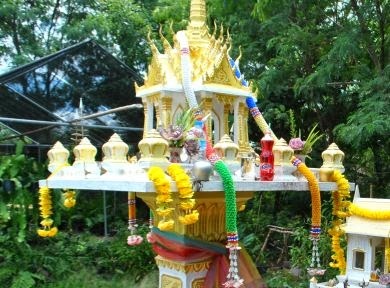 Many of the images found (when doing a Google search for Thai spirit houses) clearly show strawberry Fanta among the assortment of offerings. Thanks to such irrefutable evidence, we now know with certainty what the nectar of the gods is. That being said, some spirits appear to have a much stronger sense of self-esteem. During the construction of the Grand Hyatt Erewan hotel, workers apparently raised a spirit house which its occupants weren't happy with. Repeated instances of on-site accidents as well as ongoing construction problems prompted the developers to consult a monk who recommended that they replace it with a much fancier one. Upon taking his advice, the fortunes of the site changed suggesting that spirits are far more content when they have a cool crib to hang in.